In case you hadn’t already noticed from the celebrations all over the internet today, it’s Star Trek‘s 50th Anniversary! 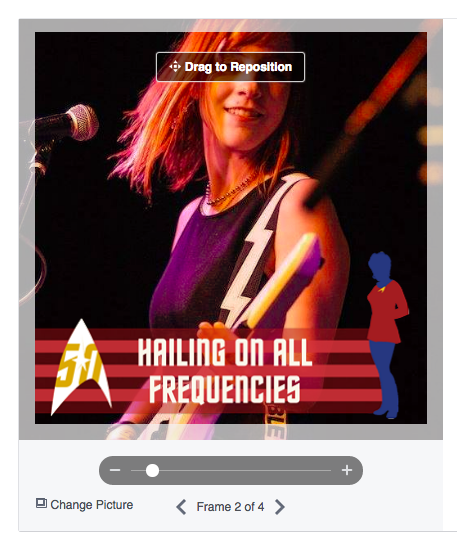 One way you can celebrate the holiday is by talking about Star Trek a lot, because why not, but you could also click “Like” on the official Star Trek Facebook page and thereby get yourself access to some themed Facebook reaction buttons. After you “Like” that page, you’ll have to refresh your browser window, and then the buttons will automatically show up. 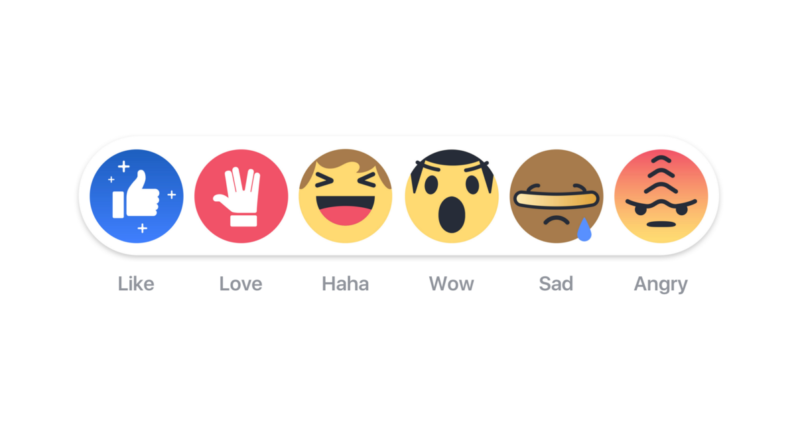 The ordinary “Like” reaction is mostly unchanged in the Star Trek version; it’s still a thumbs up, but now it’s surrounded by stars. The “Love” reaction has been replaced by the Vulcan salute. The “Haha” button has been adorned with Captain Kirk’s signature blond swoop, and the “Wow” button has Spock’s bangs and eyebrows. The “Sad” button pays homage to Geordi and his trademark VISOR, and the “Angry” button has some Klingon forehead ridges. I’m sure it was difficult to decide how the buttons would look and which characters would get featured, but I’m still sad that Uhura didn’t make the cut (she would have been great as the “Haha” instead of Kirk, if you ask me). I suppose that since her hairstyle has changed for the reboot (unlike Kirk and Spock, who have relatively similar hairstyles), it would have been hard to render her in a miniaturized emoticon form that people would be guaranteed to recognize. Really, Star Trek has so many great characters that it’s easy to think of others that could have been included here. For some reason there is no Star Trek-themed sticker pack on Facebook, either. Clearly a missed opportunity! Anyway, I’m not sure whether the buttons will only be around for today, or if we’ll have the option to keep them longer, so you may as well go enjoy them while you can. While you’re doing Star Trek-related stuff on Facebook, by the way, you might want to check out the Roddenberry Entertainment page, since they’ve also been posting a lot of cool Star Trek history to celebrate the 50th. Any other cool pages out there celebrating the anniversary? Share them with us!